I rarely write about the dangers and downsides of travel. Probably because I rarely have negative experiences, myself. That doesn’t mean they don’t happen. 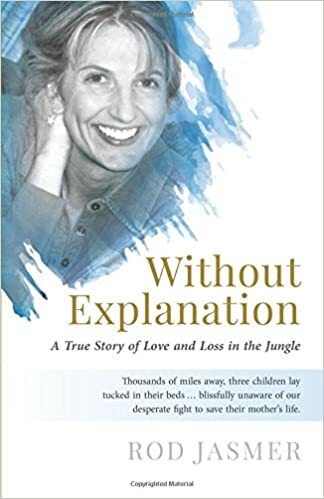 In Rod Jasmer’s terrifying memoir, Without Explanation: A True Story of Love and Loss in the Jungle, he describes the worst case scenario of a dream vacation that became a nightmare. Jasmer and his wife, Valerie, traveled to Guatemala with another couple to hike in the jungle. It had been years since they’d traveled without their children and they were looking forward to their getaway. Once they arrived in Guatemala, they set out on their first trek, eager to get moving after the long journey and start exploring. They found their way to a remote Mayan temple, and there they watched the sun set on their first day in Guatemala. Unbeknownst to any of them, this would be Valerie’s last. In the middle of the night, Jasmer was awakened by his wife’s strange breathing. Thinking she might be having a nightmare, he gently tried to wake her and quickly realized that something was terribly wrong with his wife. Her breathing was gurgled and she was unresponsive. He immediately began yelling for help and soon began administering CPR while their friends frantically tried to find help. What followed was an ordeal that could only happen in a poverty-stricken country such as Guatemala. I was right there with Jasmer as he tried to convey the urgency of his situation to people unable to provide even the basic essentials to keep his wife alive. I imagine the hospital Valerie went to as a cross between this rural Nicaraguan clinic and a more urban, substandard (by Western standards) hospital. The “ambulance” ride was roughly the equivalent of a van, driven by park rangers with no medical training. The hospital they went to was deserted and was little more than a clinic with old, dirty equipment. It reminded me of a cross between the clinic I helped build in Nicaragua on a mission trip, and the hospital that we visited while I was there. To call it unsanitary is an understatement. There were puddles of antifreeze dripping from the burn ward, which was the only air-conditioned area. Labor and delivery amounted to a room full of twin beds, mattresses with stained, dirty sheets, and women dressed in bloody t-shirts and slips after having given birth. The day we went there, we distributed baby blankets and diapers. The women only stayed a few hours after giving birth and then went home with their babies. The maternity ward of the Nicaraguan hospital I visited. It was experiences like these that I pictured the whole time I was reading Without Explanation. To the modern world, the conditions in Guatemala seem surreal. The lack of resources is overwhelming and though Jasmer describes it as factually as it happened, it seems like something that couldn’t possibly be true. How, in this new millennium, could a woman’s body be put into a loosely-crafted pine box and loaded into the bed of a pick-up truck too short to allow the back to close, to then be transported for hours in the Guatemalan sun? Like Jasmer, I was astonished to think that this could be the fate of someone — the fate of one’s spouse — on what was supposed to be a dream vacation. Except that I wasn’t astonished. I’d experienced extreme conditions like this in Nicaragua. Jasmer’s account of his wife’s final hours and the subsequent ordeal of trying to get her body back home was heartbreaking. Wracked with guilt, Jasmer wondered whether she would have survived had she been in a country with adequate care. She died without explanation. I couldn’t put this book down. It almost seemed like I was experiencing Jasmer’s ordeal in real time. He put the reader right there with him for each excruciating turn of events during an aspect of travel that I rarely consider: what if something goes horribly wrong? Have you been anywhere that was more dangerous than you’d realized? Thanks for the link, Juliann. It’s something I would never even think of happening on a vacation. But it seems like it could probably happen all too often in remote areas like this. Julie — scary story, and a reminder to all of us not to take things for granted. I think it’s always hard, balancing risk and travel to some of the places we go. That would be such a terrible thing to happen on vacation! It must be so scary especially if you don’t know the language and being in a foreign place! You never imagine these things happening while you go on vacation. Definitely not. My daughter was planning to volunteer at an orphanage next summer, but now I’m not so sure about that. I remember traveling to Eastern Guatemala from Belize to get to Tikal. The bus driver said that many of the rebels were relocated to the region. We would routinely see villagers fetching water from the river that looked less than sanitary. He went on to say that the trip was safe, if you take reasonable precautions – like never stopping or pulling of the main road, carrying multiple spare tires and having at least two extra hours of daylight to travel just in case. When we returned to San Ignacio Belize I saw the city with fresh eyes. The opulence of electricity coming into every house was not lost on me. Then you’d be able to visualize the setting in this book so well! I felt that gratefulness for modern conveniences, too, when I got back from Nicaragua and Haiti. Yes, exactly. It was a very compelling read. I felt like I was there with the author through the whole harrowing ordeal.